Widow Bomb maintains the power White Widow is known for and by crossing it with Bomb #1 the breeders have improved yield, strength, and taste. Widow Bomb produces large, diamond-white crystalline buds that are both denser and more compact than original White Widow. Huge resin-producing glands cover the plant with trichomes which spread right down onto the shade leaves making it look like it has been in the middle of a blizzard. Where White Widow can often be quite wispy, Widow Bomb stays much more compact making it much easier to grow. Widow Bomb has a bigger yield and better taste while maintaining an exceptionally high level of THC (+20%) which will undoubtedly blow you away! 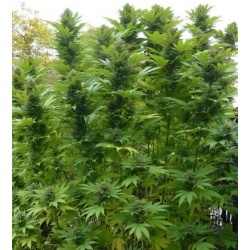 Bomb Seeds Widow Bomb feminized cannabis seeds produce an awesome plant that grows well outdoors or indoors and produces bumper yields of 450 – 550 g/m². It reaches heights of about 90 – 140cm and produces a strong, full-body buzz you’re sure to love!